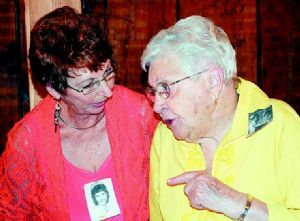 GRANTSVILLE — Armed with photographs and memorabilia, former nurses from the Memorial Hospital School of Nursing class of 1963 gathered at Penn Alps restaurant Friday to celebrate their 50-year reunion. About 32 people were in attendance at the reunion including spouses, some of whom traveled from California, Virginia,?West Virginia and Pennsylvania. Marthalena Irby, who was the clinical instructor for the?School of Nursing, was the special guest for the reunion. “I’m awfully glad to be here. The Lord has been good to me. I’ve lived 93 years,” said Irby. Irby said she lived in Goodwill Retirement Community for 12 years. “I lived in independent housing and I’m not dependent yet,” said Irby. This reunion was Irby’s first, because members of the class had a hard time locating her. A member of the class saw her name and birthday listed in the retirement home’s newsletter and was able to track her down. The nurses gathered to reminisce about the three years they spent together learning. “One of my fondest memories is living together in the nursing home and becoming like a family,” said Norma Cover Howe, who helped organize the reunion. The nursing students gathered at Penn Alps because of their ties to the founder, the late Alta Schrock. ?Schrock was a science professor at Frostburg State University and taught the nursing students for one semester. Marion Steiding Chappell of California, Charlotte Rosalie of West Virginia and Howe of Pennsylvania, were all in agreement that they had an excellent education. “We had excellent clinical skills, they taught us well,” said?Chappell. “We were well-trained,” said Howe. “I would do it all over again,” said Howe. The group tries to gather yearly and also celebrates big milestones such as their 25-year reunion. Two of the class members are still full-time nurses, according to Howe. On Sept. 6, 1963, 32 nurses attended the graduation ceremony at Fort Hill High School, graduating with a three-year diploma. Established as the Western Maryland Hospital in 1888, Memorial Hospital moved to its location on Memorial Avenue in Cumberland in 1929 and was renamed in honor of those who gave their lives in World War I. The hospital closed in November 2009 when the Western Maryland Regional Medical Center opened on Willowbrook Road.